This is the love story of Yatindra and Sadhana – nearly 55 years of sharing cheers and tears, facing odds and overcoming them, together. It’s a story of reaching great heights in their fields – he in journalism and she in painting and sketching. He also wrote books and poetry. She couldn’t lag behind – she too wrote articles and poems. They did not stop there. He did thousands of radio and TV programs. She also was on radio for numerous programs. He traveled extensively. She also did quite a bit. They were one of the most popular couples in India’s capital city of New Delhi, and later in Indore, mingling with Presidents and Prime Ministers, top diplomats and business people. They were invited by various foreign governments to visit their countries. 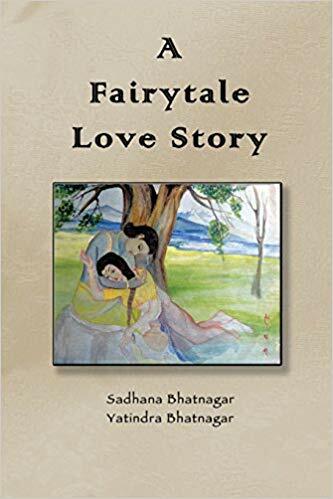 Yatindra wrote books, Sadhana contributed for some. They collaborated in some more. Sadhana raised their two lovely daughters, mainly by herself, as Yatindra got busy in reporting, writing books and traveling. She also wrote poems about him, and he did the same about her and about others too. They were always on the same page; were two bodies and one soul. With all that, she was also an excellent cook, an expert in sewing, knitting, crochet work, embroidery, singing, hospitality, making life-long friends and helping others. Together they raised good children, brought good sons-in-law and spread love far and wide. In return they got love from far and wide. They both remained love-birds, till the last day for her. Those days, he would sit by her side, hold her hand, look into her eyes, and whispered sweet nothings in her ears. This is their Fairytale Love Story. There is a vast treasury of historic events, and quite some biographical details like childhood and growing up, jobs in newspapers, marriage, sweet and sour memories, tough challenges and admirable achievements. Loved Nana’s love story. I am a fan and supporter of Tamanna since her Fremont days and I will tell you. She is so down to earth and so is her husband and family. In love with My Aliya (biggest fan) and your first child Peeshu also. I’m so happy she has an amazing supportive family. I read watch and see all her posts and her journey has been amazing. You are an amazing daughter, grand daughter, wife and mom to peeshu and Aliya. Love you always and pray that you always stay blessed. Love to nana your story makes me believe in love. I had lost that feeling a while ago but I tell you I was touched by his and nanis story. May god keep nana healthy and young always.